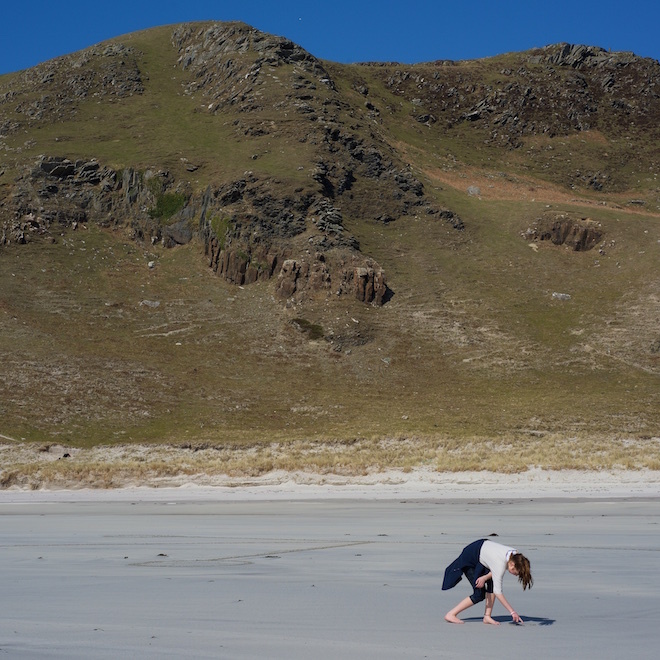 If you are planning family holidays on Mull, read on! I hope this blog with some of our top tips as to what you can do and where to go will help you plan. 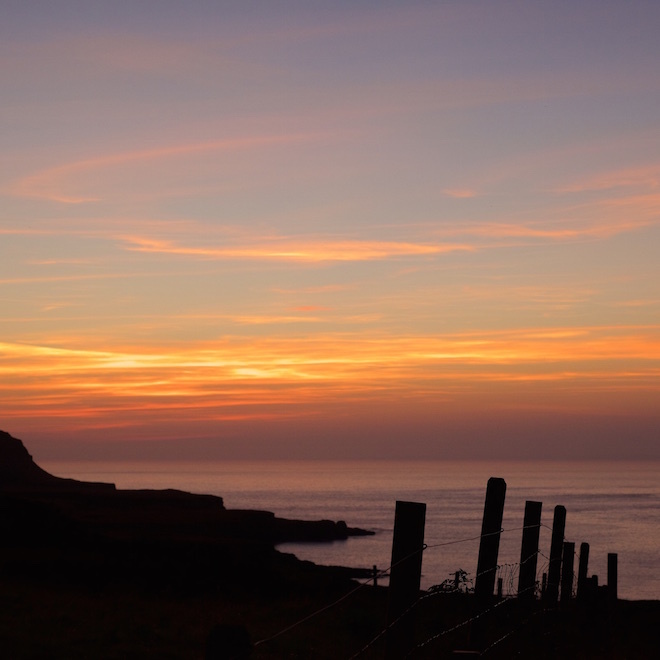 We had family staying last Christmas, and it reminded me what a wonderful place Treshnish is for a family holiday! My brother, his wife and their two boys stayed in the Studio just across the farmyard from us. This meant they could enjoy time to themselves as well as being close to us. The boys (aged 8 and 9) were outside, whatever the weather, riding around on their bikes and exploring… They loved sleeping in the box beds and were relieved that Father Christmas managed to find them. They loved the Herdwicks and the hens too. 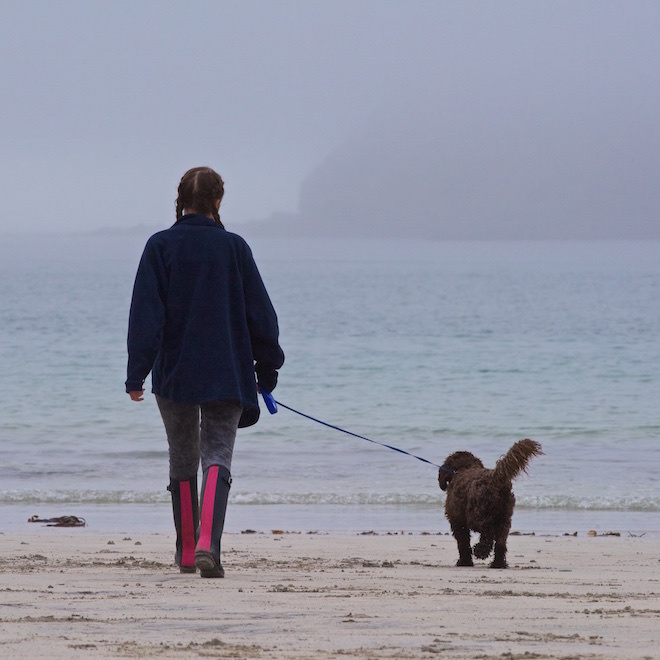 All sorts of weather didn’t put them off being outside so we had wonderful wintery walks on the beach too. We have plenty of choice here for families of 3, 4 or 5 in number! Studio and Toechtamhor are our largest cottages, comfortably sleeping 4 in 2 bedrooms with 2 bathrooms. Studio can sleep 4 adults and 2 children as there are comfortable (adults size) built in box beds in the sitting room. The twin room in Toechtamhor has a day bed meaning this cottage can sleep 2 adults and 3 children. Shian is smaller but sleeps 2 adults and 2 children, one bathroom and has a spacious sunroom. The sunroom has lovely views out to sea, good for extra play or quiet time space! Duill (pictured below) sleeps 2 adults and has a tiny second bedroom for a child (or 3rd adult). 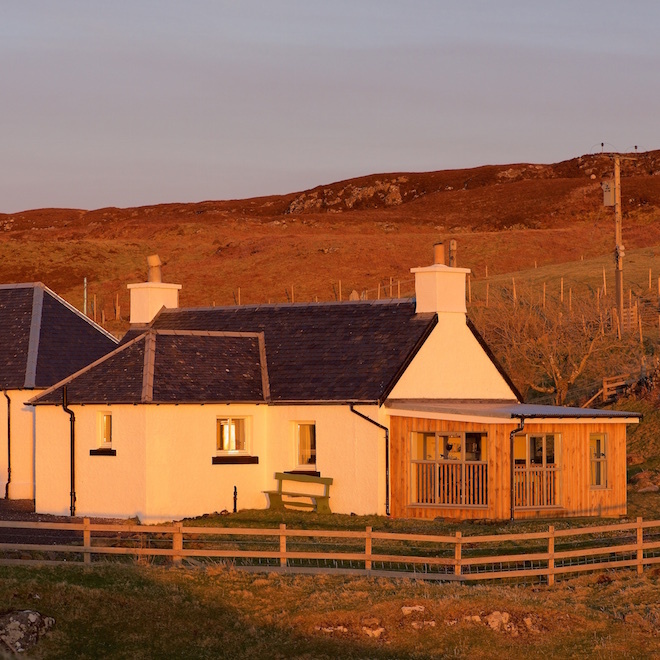 If you fancy cosying up 2 adults and one child can be accommodated in both East and West Cottages down at Haunn too. Mull and Iona have a growing reputation as a good place to source local produce in the shops and in cafes and restaurants. Close to Treshnish there are several places to eat which not only support the ethos of using local produce but are family friendly too! Am Birlinn is 6 miles away in the direction of Dervaig. The Bellachroy Pub in Dervaig is 8 miles away. Calgary Tearoom is 3 miles away close to the beach. In the other direction Ballygown is open in the evenings and does an early sitting suitable for families with small children. Ulva Boathouse is an exciting boat ride away on the isle of Ulva. Children can play on a ‘pirate’ boat whilst parents enjoy the views, wonderful exploring walks too! When in Tobermory look out for delicious Isle of Mull Ice Cream too – the Parlour is right on the seafront! Explore the farm – it is rich in local history and walks in every direction provide wonderful views. Count the islands you see whilst walking along the coast. Look for the boat carved in stone in the deserted village at Crackaig. Search for the Whisky Cave, and find the remains of the illicit whisky still. Spend the day on one of the local beaches and walk to the beautiful white sandy one with the ‘secret surprise’. (We can tell you how to get there). We haven’t ever done any Geocaching ourselves, however there are several geocaches on the farm. 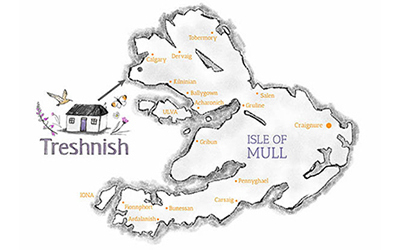 Follow this link for more information about geocaching on Mull. Tobermory Aquarium is a fantastic place to take children (adults). It is Europe’s first catch and release aquarium. Why not combine a trip to the Aquarium with a look at how they make cheese at the Mull Cheese farm near Tobermory? But don’t forget the lovely Mull Museum too! 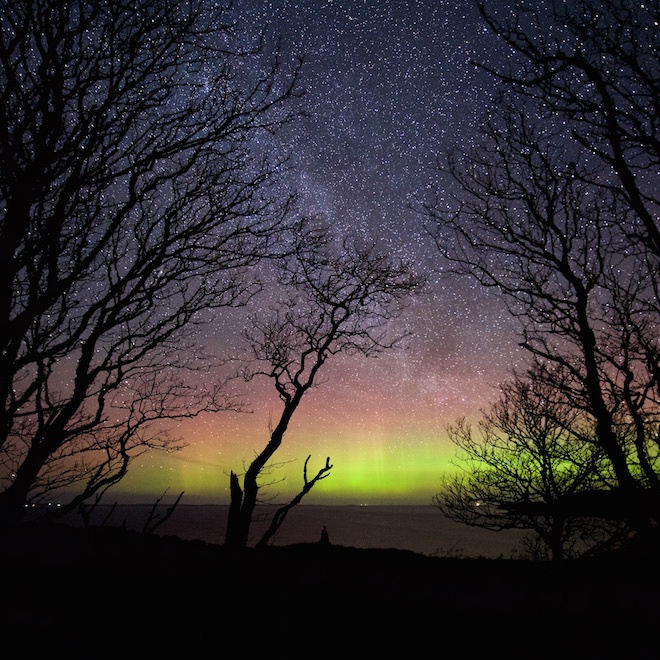 Our dark skies are wonderful for star gazing, and Treshnish has no light pollution so if the skies are cloudless the stars can be wonderful. I remember one Easter, a family from Glasgow came to stay with us. The parents told us their children had never seen the stars! It was amazing to be able to knock on their door at 10pm (their lights were still on!) and show them, not only the stars but the Northern Lights! The photograph below was taken from the farmhouse garden near the 4 Treshnish Cottages on the 5th January 2017. It is possible, given the right conditions, to catch the Aurora Borealis on camera between September and April. For quieter times we have a selection of family viewing DVDs in the Phone Room, as well as children’s books and games. You are welcome to borrow them! I will write a second blog about this soon, as there are many more tips we can give you for a magical family holiday on Mull….